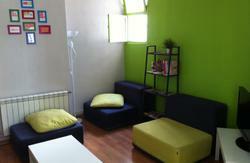 Madrid Motion Hostel is a brand new youth hostel located at Madrid's very city centre. 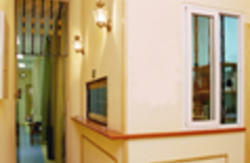 Our hostel offers you bedrooms for 2 to 6 people with private bathrooms, buffet breakfast included in the price and a wide set of common areas and services. All 2, 3, 4, 5 and 6 bedrooms feature private bathrooms, big windows with views to the city centre, air conditioning and heating, top quality wooden beds, mattresses and bed linen and individual lockers. If you are looking for culture and entertainment, we also organise free city tours, flamenco shows, activities inside our bar, like our tapas workshops & tastings, and visits to Toledo, Avila and Segovia among others. If you are coming from the airport, take the subway (L8), and commute to Callao Station, 50m away from the hostel. If you are coming from Atocha or Chamartin train and bus stations, take the subway and commute to Callao or Sol Stations, 50m and 250m away from the hostel, respectively. If you are coming by car, take the M-30 beltway, 18th exit to 'Plaza de Espana', turn right at the Gran Via Avenue and, after passing by the 'Plaza de Callao', take the first exit to the right, Calle de la Abada, and drive 50m until you reach a square where the hostel is located.